This ledger originally marking the grave of Abbot Bernard Henry Pennings in Mount Calvary Cemetery, West De Pere, Wisconsin, was removed and erected here in the Summer of 1959. 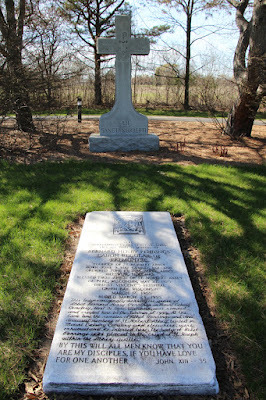 At the same time the remains of Abbot Pennings and other deceased members of St. Norbert Abbey buried in Mount Calvary Cemetery and elsewhere were exhumed and re-interred here. The body of Abbot Pennings was placed in the crypt of St. Joseph within the Abbey walls. The marker is located on the grounds of St. Norbert Abbey, in the Abbey cemetery, at 1016 North Broadway, De Pere, Wisconsin 54115. NOTE: Check the Google Map before heading out to the location; the Abbey grounds are expansive. 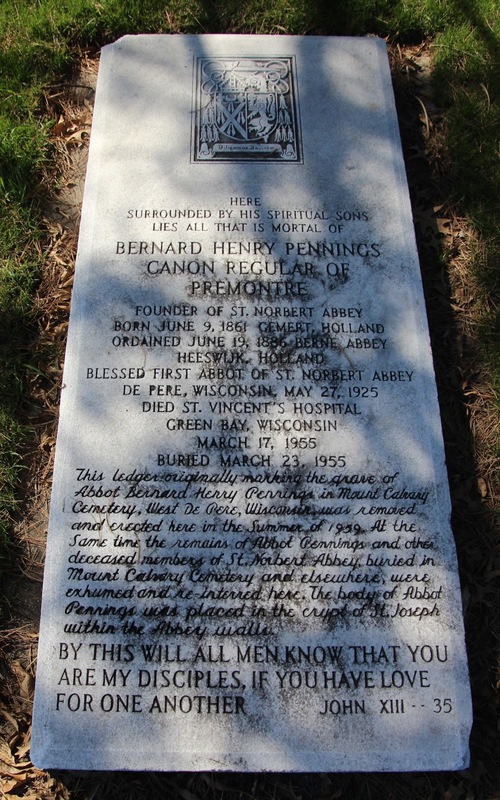 Abbott Pennings is buried at St. Norbert Abbey in De Pere, Wisconsin.